Will you be making a New Year's resolution to cook more, eat out less and/or eat more kale? Here are a few ways to bulk up your kitchen arsenal and help you avoid the mid-week take-out trap, plus our favorite way to cram more kale into our diet. Freeze cooked grains! We've discussed this before, but it's enough of a lifesaver that we'll risk being repetitive: brown rice and quinoa (and, apparently, millet) freeze beautifully. Once you've cooked your grains, just cool to room temperature and seal in plastic bags or tupperware in 1-cup portions. Retrieve when you're starving, transfer to a bowl and nuke 'em for 2-3 minutes while you stir-fry some kale. Freeze other stuff you use a lot! Pesto in ice cube trays! Mass-caramelized onions! Your favorite soup! Anything else you want to be able to pull out of your back pocket at the end of an arduous day! If you're in the middle of a butternut squash avalanche (and hey, this time of year, who isn't? ), try making and freezing this pie. Make vegetable stock with your trimmings! If you eat and chop a lot of veggies, you'll probably have accumulated enough carrot tops, onion skins and parsley stems by the end of the week to make vegetable stock. Homemade stock is cheaper--you were just going to throw that stuff out, anyway!--and more delicious than powdered boullion cubes and freezes very conveniently (a yogurt container's worth tends to be just the right amount for a soup that serves 4). To make your own stock, save whatever trimmings you accumulate in a container in your fridge. (Try garlic and onion skins, carrot/parsnip/sweet potato peels, celery bottoms and leaves, stems from fresh herbs, leek and scallion tops, mushroom stems--anything except potato skins, broccoli, kale, spinach or cabbage trimmings, since they won't taste good in stock. If you eat meat, save chicken or turkey bones and throw them in too). When you have a little time at home, cover the trimmings and a handful of whole peppercorns with water in a large stock pot, bring to a boil, and simmer for about 45 minutes. Strain, salt to taste, and cool to room temperature. Freeze in whatever portions are convenient for you and your amount of freezer space. In addition to being a soup base, this stock can be used instead of water to cook rice, quinoa or other grains. Bow down to sprouts! We try to always have a container of sprouts handy so we can throw them into salads and stir-fries for quick protein without all the fuss and time-sucking of soaking dried beans. We love making lentil sprouts, but you can sprout whatever suits your fancy OR you can also find mung bean sprouts in almost any grocery store in the produce aisle. Realistically menu plan! Taqueria dependence is usually the result of (a) not having anything else planned or (b) having something elaborate and unrealistic planned. As veterans of cooperative living, we've been menu-planning for years (indeed, this blog is the result of wanting to just archive our menu ideas somewhere safe and fireproof! ), but sometimes even having something planned and having all your ingredients handy isn't enough to ward off the desire to throw up our hands and succumb to the prepared section at Whole Foods. We've noticed that this generally happens to us on Wednesdays, when whatever labor-intensive dish we gleefully planned on Saturday suddenly seems like an insurmountable struggle of chopping, roasting and otherwise not getting dinner for an hour. So get in touch with your burn-out schedule and plan accordingly: we've started either making a double batch of whatever we have on Sunday and eating the leftovers on Wednesday, or having Wednesday dinner be chilaquiles, miso soup, Wheeler greens (below) and defrosted quinoa, or something else that can come together quickly. About a year and a half ago, we went to visit our friend Little Phoebe (both smaller and younger than the original) and when lunch time rolled around, her roommate, Wheeler, went out into their garden, picked some dark leafy greens, and made us a simple, delicious lunch: swiss chard, sugar-snap peas and sunflower seeds over brown rice with fried tofu. We make a variation with winter ingredients as well. The beauty of Wheeler greens is that, so long as you have some cooked rice or quinoa on hand, you can make a satisfying meal with complete protein and lots of calcium without breaking a sweat. Before you start chopping your veggies, put a few cups of water in the teapot to boil. Smash unpeeled cloves of garlic with the bottom of a jar or crush them under your knife with enough force to bruise, but not destroy them. Remove the skin and chop each clove into a few large pieces. (It sounds picky, but big bruised hunks are the key to making your stir-fried garlic taste fresh, not stinky.) Chop the peas in half (or thirds, if they're mutantly huge sugar snap peas) and slice the greens finely. Put your sliced greens into a colander in the sink and pour the boiling water over, steaming the greens ever-so-gently. (This will get rid of the bitterness in kale or collard greens). Heat the canola oil in a wok over medium high heat. First add the garlic and stir a few times. Next, add your sugar-snap peas. When they are just getting warm (Wheeler greens are served al dente) add the seeds, nuts, sprouts, salt and greens. Stir until the kale is wilted, then serve over rice. Voila, complete meal for two in 15 minutes or less. Rutabagas, like brussels sprouts, are an often-mistreated winter vegetable with a lot of untapped potential--and, also like brussels sprouts, they play better with fat than with water. Tonight, one option: tiny cubes of rutabaga browned in butter with some fried onions and righteoused-out with ribbons of dark kale. Rutabagas respond well to smoky flavors and are frequently paired with bacon--our smoky flavor comes from smoked Spanish paprika. It's probably delicious with a sprinkle of Parmesan cheese. This dish cooks up pretty quickly because we chopped the rutabaga into 1/2-inch dice. But we can do this without much effort with our french fry cutter, and if you don't have the time, desire or gadgets to wrangle a rutabaga into uniform tiny pieces, you can chop into larger cubes and just cook longer (you may need extra butter, or some water or stock). Make sure to peel the rutabaga well--the skin is pretty thick and sometimes waxed (yuck!). Add the rest of the butter and oil, rutabaga cubes, salt, pepper, and paprika to the skillet and stir well. Turn the heat down to medium, cover tightly and cook for about 10 more minutes, stirring occasionally, until rutabagas are tender (it will take longer if your chunks are large). Uncover, add kale, and stir quickly for 1-2 minutes until kale is wilted. Adjust salt and pepper as desired. Eat. Our niece Sierra is only one year old and she already hearts kale, especially in the form of this smoothie recipe from her mama. But this green concoction isn't just for babies--it's a great morning pick-me-up or post-workout snack for fully grown people, too. Apple juice, peach and banana are sweet enough to balance out the bitterness of raw kale--you should try to get a sweet purple or red kale (like Red Russian or karinata). The original recipe made enough for a hungry baby, so we scaled this up to feed a grown-up. If you're making this for a baby, use 4 ounces apple juice, 2 slices peach, 1.5 leaves raw kale and 2 tablespoons of banana. Blend. Drink. Eat some solid food afterwards if you're ready for that kind of thing. Something I noticed the last time I visited my grandma is that instead of frying up an individual batch of onions every time she makes mjeddra, she fries onions in mass quantities, freezes them in mjeddra-sized portions, and then defrosts them in the oven while the mjeddra is cooking. I like my mjeddra onions super-crispy and I doubt they'd work frozen and defrosted, but we decided to borrow Grandma's technique for something we would love to have on hand: caramelized onions, which are a great addition when you want a rich flavor, but can take forever. So on Sunday night, we sliced up and caramelized five onions and have been chipping away at them for quick meals and snacks, which is how we came up with this cebolladilla--like a quesadilla, but with onions instead of cheese! The decadence of the onions and the smokiness of the chipotle really make this a winning appetizer or mid-evening nibble. It would also be delicious as a dip with corn chips or a spread on toast. If you haven't caramelized five onions recently--and if anyone besides my grandma has, I'd love to hear about it--you can still make this and just caramelize the onions on the spot. But consider mass caramelization (particularly those of you with winter breaks approaching), since it will be a welcome shortcut later on. First, caramelize the onions if you haven't already. To caramelize, chop the onion into rings and cook in a sauce pan over low heat with a little olive oil. Stir occasionally until they are completely wilted and have turned brown. Depending on how many onions you're using, this could take anywhere from 1/2 an hour to an hour. When we made our master batch of five onions, we had to use our largest sauce pan to contain all the chopped onions. By the time they finished caramelizing, we had about 2 1/2 cups. Place the chipotle chile in a small bowl and pour boiling water over it. Cover with a plate and let sit for 15-20 minutes to soften. When chile is soft and onions are caramelized, combine the pine nuts, onions, chile, cayenne and salt in a food processor. Blend until you have a paste. Taste for salt and spice (if you're like us, you'll want more cayenne!). Spread the paste on your corn tortillas to make sandwiches. Fry each cebolladilla over medium-high heat with a small amount of canola oil, a few minutes on each side or until the bottom is golden brown. That crispy corner of onion that sneaks out around the edge of the tortilla is the best part, so skip the Lactaid for once and chow down! This is the third and final recipe from our spontaneous dinner party, but we had to wait a bit to post it because we wanted to make a new batch and take process pictures. Lemon chutney is a versatile addition to your fridge--it really perks up a simple meal of grains and kale, is outstanding dolloped on mjeddra, and a straight spoonful is helpful when you feel a yucky cold coming on. (No, that statement has not been evaluated by the FDA, and there hasn't been a randomized double-blind trial, but come on, it's tasty) Best of all, it lasts a really long time in the fridge, so you can whip this out three months from now when you need a little something extra for your dinner party. The recipe below, adapted from Madhur Jaffrey's World Vegetarian, is for a 12-ounce jar. If you want to make mass quantities for gifts and/or disaster preparedness, we did this times five last night--no need to adjust proportions, just scale up (and practice multiplying fractions while you're at it). Wipe the lemons with a damp cloth and then dry them off. Cut into 1/8 inch-thick slices, then cut those slices into 1/8 inch-thick dice and remove the seeds. Place the lemons in a large saucepan (stainless steel or enamel--cast iron isn't good for this kind of thing) with the salt, turmeric, cayenne and honey. Bring to a simmer and cook gently about 5-6 minutes. (Don't worry if it isn't chutney consistency yet--it'll get thicker as it cools, particularly once it's refrigerated). Transfer mixture to a clean 12-ounce glass jar. Once it cools to room temperature, screw on the lid. Leave the chutney in a dark corner for 5 days before refrigerating. This will keep in the fridge for at least 3 months. You may notice the difference in color between the serving suggestion photo and the simmering in the pot photo. The chutney in the first picture was about 5 months old, and has had plenty of time to soften and mellow. Happy Chanukah, blogosphere! To celebrate the first night of the festival of lights, here is our latke recipe, with enough oil to light up your whole block. Some latke recipes use flour as a binder; ours uses the natural starch in the potatoes, so it's gluten-free. If you feel you need to add more binder, we suggest potato flour. Because we'll be eating latkes a lot this week, it's important to mix it up and go beyond the traditional sour cream and applesauce topping options. We dolloped ours with guacamole and some Vicky Day's raspberry-red currant preserves (not in the same bite--our weird food combinations have limits). These preserves are made by our friend and guest blogger Honor's family with fruit grown on their farm in Vermont. So far I've only tried this flavor of preserves--the tart currants and the flavorful raspberries are delicious with latkes, atop a Camembert-slathered slice of bread, with peanut butter and plenty of other combinations I haven't yet tried (I want to make some rugelach before the jar runs out). Their preserves do have refined cane sugar, but they also make a blackcurrant maple syrup, with a sweet-tartness that I'm excited to try in a marinade or salad dressing. And obviously, we served this with a side of brussels sprouts, stir-fried with Tokyo turnip tops...perhaps it's time to change our name to I Heart Brussels Sprouts. Grate your potatoes and onion and place them in a cloth towel and wring out as much liquid as you can -- catch the liquid in a bowl. Let the potato juice sit for a few minutes, then pour the liquid from the bowl, saving the potato starch that has collected in the bottom. Write your initials in it with a fork. Well done. Mix the potato starch, potatoes and onions with the rest of the ingredients, except the oil. Heat a large cast-iron frying pan over medium-high heat with about two tablespoons of the oil. When the oil is hot (but never smoking) add spoonfuls of batter, pressing them flat with your spoon. When the bottom is crispy and brown, flip to the other side and fry until golden. Refresh the peanut oil as needed, usually before each new batch. (Don't even try to use olive oil or another low-heat but healthy-sounding alternative. You'll be sorry when the smoke alarm goes off.) Drain on brown paper bags or paper towels. Serves about 5 moderately hungry people, if you don't eat them all before dinner. There was a point when we first discovered quinoa that we were sending dinner guests home with a jar full of it. We've backed off (hey, do you think we're made of quinoa? ), but we still love it just as much. For the quinoa virgins among you, it's amazing stuff: complete protein and more calcium than milk, packed into fluffy, quick-cooking morsels. It's gluten-free and, when that time of year rolls around, kosher for Passover! One thing to keep in mind when you first start experimenting with quinoa is that has a bitter coating, so you should always rinse it well in a mesh strainer before you cook it. If you can find red quinoa, a mixture of red and white turns out beautifully. 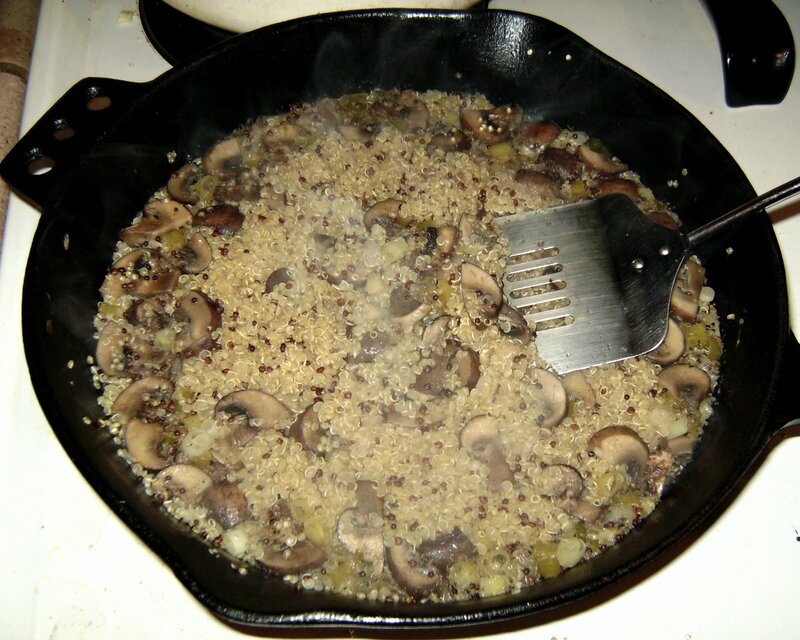 This mushroom quinoa recipe came from Madhur Jaffrey's World Vegetarian, one of my favorite cookbooks of all time--we've used more scallions and mushrooms than the original. Last night when we made this recipe, we also found ourselves with half a head of Belgian endive, leftover from making the celery endive slaw from the November issue of Martha Stewart Living (and if you don't subscribe, don't judge). We both found raw endive too bitter, reminiscent of our one disastrous run-in with bitter melon, and Madhur Jaffrey came to the rescue AGAIN with the brilliant idea to give endive our the standard household vegetable treatment: douse in fat, roast in oven, sprinkle with salt. 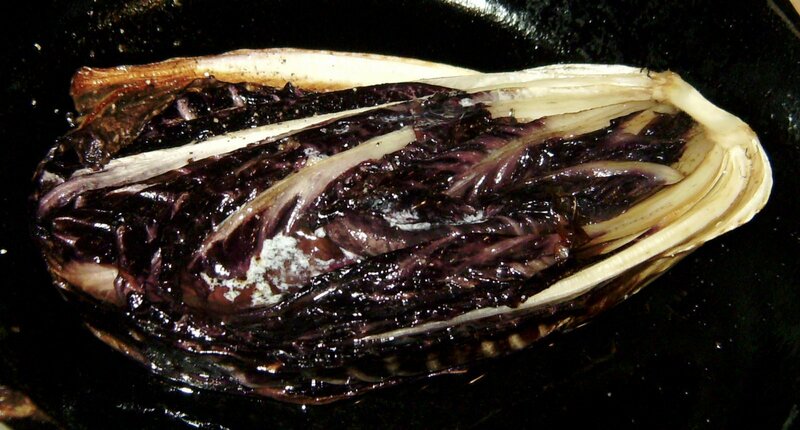 We've scaled down her recipe to use just half an endive. The white part took on a bok-choy-like juicy sweetness, and the purple leaves really diminished in bitterness (I liked them, but Phoebe still found them too strong). 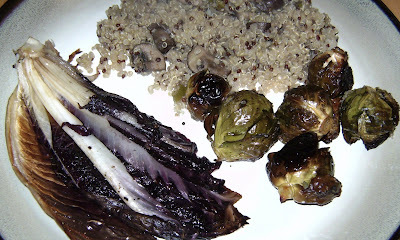 We rounded out the meal with some roasted brussels sprouts. To start, rinse the quinoa in a mesh strainer and let it drain while you do everything else. Heat the oil in a large cast-iron skillet over medium-high heat. Add mustard seeds, and when they begin to pop, throw in the diced mushrooms and ginger. Stir for one minute, add scallions, stir twice and turn heat to medium-low. Add quinoa and stir to coat with everything else, then pour in stock. Bring to a boil, then cover tightly, lower heat and simmer for 25-30 minutes, until water is absorbed and quinoa is fluffy. Preheat the oven to 350. Trim the very bottom of the endive head, making sure to leave enough to hold the leaves together. Warm the oil in a small cast-iron skillet over medium-high heat. When the oil is hot, add the halved endive, face-down, and cook 2-3 minutes, until browned, then flip and brown the other side. Remove from heat, sprinkle with salt and pepper, dot with the butter and cover with a tight-fitting lid or some aluminum foil. Transfer the skillet to your preheated oven and bake for 15-20 minutes until tender. Look, we love Cafe Gratitude as much as the next kale enthusiasts, but sometimes we want a nourishing grain bowl without having to pay $9 and tell our server what we do to create abundance in our lives. (Our rule of thumb is that no matter what the question of the day at Cafe Gratitude is, my answer is "breast-feeding"). 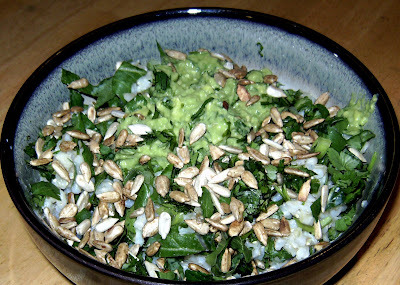 So for those nights, we created this version of the Yo Soy Mucho bowl at Cafe Gratitude...for way cheaper/mas barato. If you have cooked rice already, you can just heat it up and add in the fixins--try freezing cooked rice in 1-cup portions to use as emergency food when you don't want to cook! Rinse the brown rice in a fine mesh strainer. In a medium saucepan, combine water, salt and olive oil and bring to a boil. Add rice, return to a boil, then lower heat, cover and simmer 40-45 minutes, until all water is absorbed. Divide kale into serving bowls, and cover with a scoop of rice. Stir with a fork--if you've sliced the kale thinly enough, this should steam it lightly. Top with avocado chunks or guacamole, scallions, sprouts and sunflower seeds. You can also add some salsa if you want it, or chopped fresh tomatoes when they're in season.